A bill to address California’s drought and future water supply in the House of Representatives has Gov. Jerry Brown angry. Brown said the water bill is “an unwelcome and divisive intrusion” into California’s effort to manage the state’s drought, the Sacramento Bee reported Monday night. H.R. 3964 by California Congressmen David G. Valadao, CA-21, Devin Nunes, CA-22, and Kevin McCarthy, CA-23, is a comprehensive bill to resolve the water crisis in California, according to the congressmen. H.R. 3964 would undo years of environmental dominance in California’s water priorities. Valadeo, Nunes and McCarthy say the bill would undo a San Joaquin River restoration program, would improve water access for Valley farms. The San Joaquin restoration program to restore flows to the San Joaquin River from Friant Dam to the confluence of Merced River and restore a self-sustaining Chinook salmon fishery. What Brown could be angry about is the California Department of Water Resources announced in November that the Central Valley would only get five percent of the water it needs in 2014. Valadeo’s office reported Thursday, U.S. Bureau of Reclamation Commissioner Michael Connor upheld Valadao’s position, along with other Central Valley lawmakers, regarding rescheduled water deliveries for Central Valley Project water contractors. The letter to the Bureau urged the Administration to reconsider halting rescheduled water deliveries to San Joaquin Valley farmers. The letter stated strong opposition to the use of rescheduled water to meet other Central Valley Project water delivery needs at the expense of farmers and contractors in the Valley. “H.R. 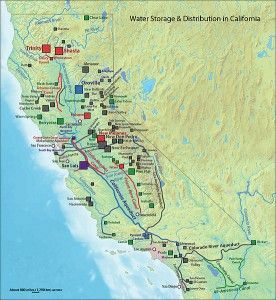 3964, the Sacramento–San Joaquin Valley Emergency Water Delivery Act restores water reliability to California communities by codifying the bipartisan Bay-Delta Accord,” Valadeo’s website says. “It also reforms onerous federal laws – such as the Central Valley Project Improvement Act and the San Joaquin River Restoration Settlement Act – that have severely curtailed water deliveries and resulted in hundreds of billions of gallons of badly needed water being flushed into the ocean.” Valadeo represents Kings County and portions of Fresno, Tulare, and Kern Counties, three of the hardest-hit counties in the recession and drought. Valadeo’s website recently reported House Republicans passed comprehensive water policy reform legislation for California (H.R. 1837) in February 2012. The bill would have mitigated the water crisis now going on in the Central Valley. However, the bill died in the Senate “due to the opposition of California’s Democratic Senators,” Valadeo’s website reported. “No Senate hearings were held, nor were any amendments offered or alternatives proposed. Furthermore, the Senate recently prevented the addition of emergency drought relief provisions for California in the Farm Bill,” the website said.